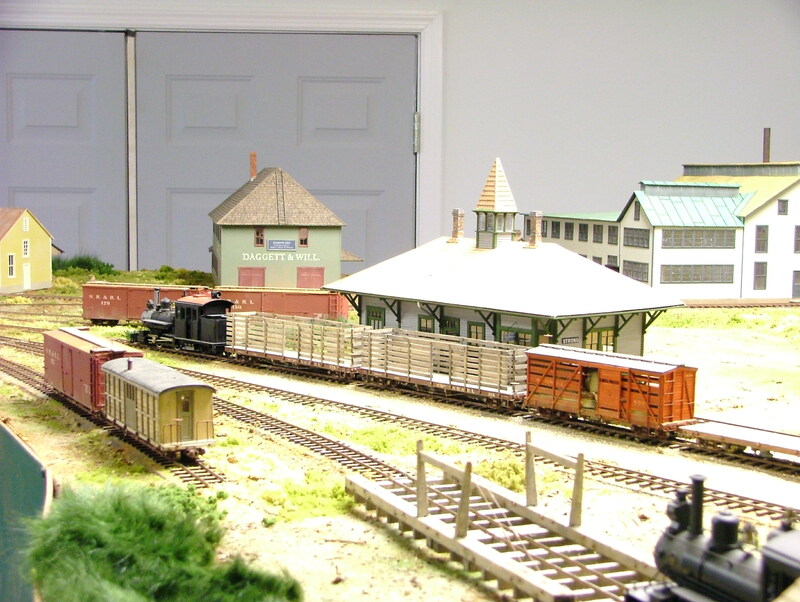 I completed several sections of the layout, including the Phillips yard and the Rangeley / Marbles area, prior to moving into our current house in 2001. I spent the next several years building cars and structures, while working on all of the necessary installation of drywall, suspended ceilings, lighting, etc. The mainline between Phillips and Strong was in place by the summer of 2005, with work then proceeding north from Phillips to Reeds and South from Strong toward Farmington. I am still working on Room 4 (the right-most room, on the plans below), with the large balloon loop containing the trackage between Maplewood and Strong, as well as the South Strong station and (on the line to Kingfield on the next level up) the site of Starbird's Mill completed in the summer of 2013. All of the On2 and O-standard track is in place at Farmington, with the SR&RL / MEC station completed, and scenery added in the summer of 2015. Aside from the Rangeley / Marbles area, I have not done much with the upper level -- there are always little glitches to fix on the lower level, and there is a reason why they call this scale "no-run-2"! I have made some modifications to the plans below, most notably in the position of the International Mill in Room 2 and in the position of Strong in Room 3. The photos will give you a better idea of what went where. I have been working on the layout for quite a while now and, for the most part, I am quite pleased with the results – I hope that you will be, too!